We simplify your complex manufacturing systems, providing clarity, control and confidence — for bottom line predictability and a clear competitive advantage. 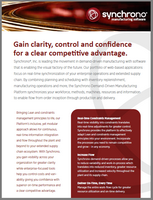 Synchrono® software and services transform how you manage constraints, increase flow and drive on-time delivery. Contact us to learn more about our company, our software, how we do business, and the benefits of a demand-driven manufacturing environment. Synchrono® is a dynamic, growing company – in the news and on the move; innovating real-time demand-driven manufacturing solutions. We invite you to follow us and stay in sync.